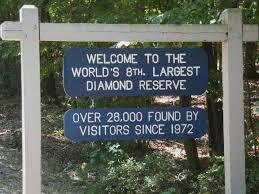 Have you ever heard of Crater of Diamonds State Park in Arkansas? The place where you can sift through the dirt and look for the sparkle of a diamond? I so wish my parents had taken me here when I was a kid!! Even though the possibility of finding a diamond is small–only about 1-2% of all visitors leave with one–the probability of having a good time is very high. 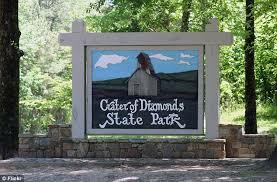 Crater of Diamonds has been a state park since the early 1970s. The park encompasses over 900 acres, but 37 of those acres sit on a volcanic pipe. This pipe, which was part of a 95 million year old volcano (long since eroded), carried diamonds to the Earth’s surface. 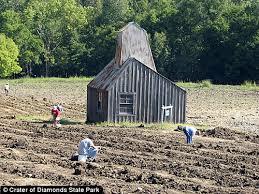 Today, Crater of Diamonds is the only diamond-bearing site that is open to the public. For eight dollars you can search from morning til night. The park has exhibits and videos that give you the history of the area as well as good tips on how to search for diamonds. It has equipment you can rent, things like shovels and sifting screens, or you can bring your own. Over the years the park has been the location for some remarkable stories. The biggest diamond ever found there, or anywhere in the U.S., was a 40.23 carat stone called Uncle Sam. It was found back in 1924, when the area was still owned by a diamond mine. Other big finds have been made over the years. As recently as 2015, an 8.52 carat diamond was found, and has been named Esperanza. Most of the diamonds found, however, are small. Approximately 90% of the diamonds are less than 1/4 carat, which is only about the size of a match head . 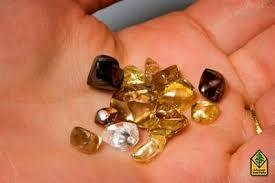 The diamonds from this site are yellow, brown, or colorless. They are not easy to find, but one feature that helps is that they look polished, almost as if they have an oily film on them. Also, they’re usually translucent, which means you can see into them but you can’t see through them. If you’re not sure what you’ve found, there is an expert at the site, ready to help you with identification. The park is a popular place. It had 168,000 visitors last year. In addition to looking for diamonds, there is a water park and camping. It sounds like the place for a perfect day, if you’re a kid. Go get dusty and dirty looking for rocks, and then get cooled and cleaned off at the water park! Heck, it sounds great even if you’re not a kid!! If you’d rather look for colored gems, amethysts, garnets, and agates have also been found at Crater of Diamonds. But there are, perhaps, better locations in the U.S. if you’re rockhounding for colored gemstones. Check out Gem Mountain in Montana for sapphires. Or Emerald Hollow Mine in North Carolina for emeralds, rubies, and aquamarine. Morefield Mine in Virginia is a source for amazonite, beryl, garnet, amethyst, and topaz. Perhaps you’ve seen the phrase, “Lazare. . .the World’s Most Beautiful Diamond.” Your mind might question the assertion. After all, aren’t all diamonds beautiful? How can a company make this claim? The answer lies in the cut. In 1919, the cousin of founder, Lazare Kaplan, developed a mathematical thesis for cutting diamonds to precise angles and proportions to gain the optimum reflection and refraction of light. When a diamond is ideally cut, light rays from all sides are bent towards the center of the diamond and are reflected back through the top. 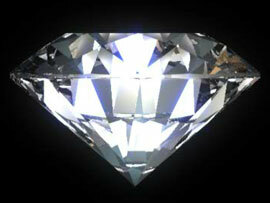 If not ideally cut, light will “leak out” through the sides or bottom of the diamond. The beauty of a colorless diamond is all about its brilliance, scintillation, and fire. The Lazare Ideal cut maximizes all three. Finally, a beautiful diamond is one that can be yours forever. Every Lazare diamond of 0.18 carats and higher has the Lazare logo and an individual identification number, laser inscribed on the diamond’s girdle. This logo is your proof of authenticity as an ideal cut Lazare diamond, and the identification number is your proof of ownership. 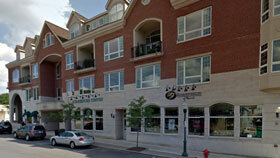 Lazare Kaplan International, Inc. has been in business since 1903. It plans to be around for a long time to come. When it’s your turn to look for the world’s most beautiful diamond, be sure to remember Lazare. Most couples looking for a diamond engagement ring are already familiar with the color scale for diamonds. They know that “D” is the “best” if you want a colorless diamond. It’s just accepted. But why start with D? There are historical reasons why color grading doesn’t start at the beginning of the alphabet. The story is interesting, but basically boils down to the struggle between metaphoric or geographic vs. scientific description. In the late 1800s, when diamonds and diamond mines were being discovered and dug in Cape Province, South Africa, there was little consistency in the description of diamonds. 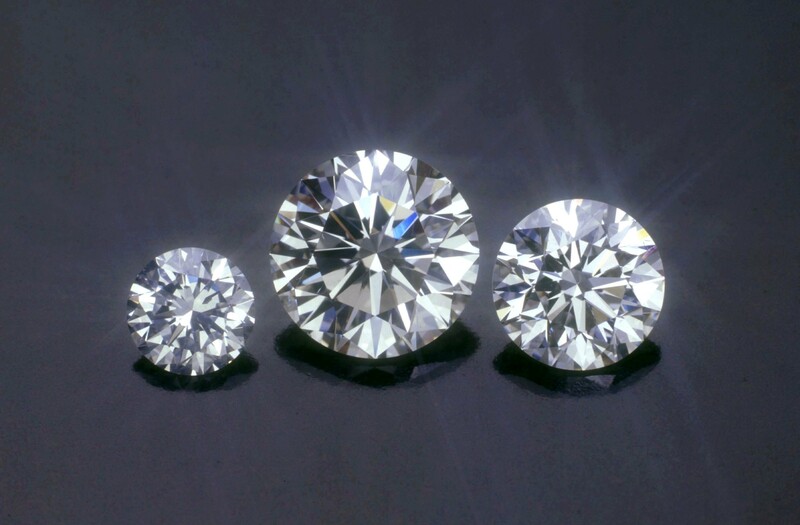 Diamond brokers came up with various ways to grade diamonds, using I, II, and III or A, B, and C to indicate quality. Later, AA and AAA were used to indicate even higher quality than A. There was a wide range of diamonds that fell into each quality designation, and the grade often depended on who was doing the grading. There was no set grading system that everyone agreed to follow. The goal was to sell diamonds, so grade inflation was common. Some grading terms were even more vague than A, B, and C. Old world terms for colorless diamonds included “River”, “Finest White”, and “Jager.” Where do these terms come from? River was meant to indicate the clear, as water, nature of a colorless diamond. Jager was a nickname for the Jagersfontein Mine in South Africa, a mine known for the exceptional quality and clarity of its diamonds. This mine was also known for producing two of the biggest diamonds ever found, the 972 carat Excelsior and the 637 carat Jubilee. In the 1930s, when the Gemological Institute of America(GIA) was first established, it focused on the science of gemology and the importance of education. Eager to bring more consistency to diamond grading, the GIA developed its international diamond grading scale in 1953. It wanted to clearly separate its scale from existing scales. The GIA started with D so as not to be confused with the A, B, and C grades that already existed in other, less consistent scales. That’s why the scale starts with D and goes through Z for the normal color range of diamonds. The GIA scale is much more scientific, with more grades and a set of master stones to represent each color grade. Skilled graders compare stones to this master set under specific lighting conditions. The American Gemological Society(AGS) has a numeric as well as letter grading system, with D equal to 0.0, E equal to 0.5, F equal to 1.0 and so on. Both the GIA and AGS use descriptive words to go along with their grades so, for instance, grades of D, E, and F are described as colorless while grades of S through Z are described as light yellow. If a diamond is more yellow than the Z master stone, it’s actually a fancy colored diamond and is graded using a different system. So it was those diamond sellers back in the 1800s that shaped the system we have today. Even with the unusual starting point, consumers should be grateful for the consistent grading that the GIA and AGS provide. Diamonds seem to come mostly from Africa or Russia or Canada. But prior to the 1800s, diamonds came from India. And Shah Jahan, the same Mogul ruler who commissioned the Taj Mahal, was the owner of some of the world’s largest and most precious diamonds. He reigned from 1628-1658 and, during his reign he possessed famous diamonds such as the Koh-i-Noor, the Orlov, and the Hope Diamond. Of course, they may have looked different in the 1600s than they do today. Diamonds have often disappeared and then disguised by being re-cut. The famous ones have a colorful past–even if they are colorless. The Koh-i-Noor is in the cross atop the Queen’s crown. The Koh-i-Noor had many homes before reaching its current resting spot in the Tower of London. When the Mogul empire was taken over by the Persian, Nadir Shah, in 1739, this diamond and many others were passed to him. When he was assassinated in 1747, the diamond went to the King of Afghanistan. Unfortunately, the King had to surrender the diamond to Ranjit Singh, founder of the Sikh Empire, in order to avoid death. And then Singh had to give up the diamond to the British East India Company, who claimed it for Queen Victoria. It has been in England ever since 1848. But it was re-cut during Queen Victoria’s reign and, as a result, lost about 43% of its mass. Queen Victoria and later Queens of England have worn the diamond in either a necklace, a brooch, or a crown. 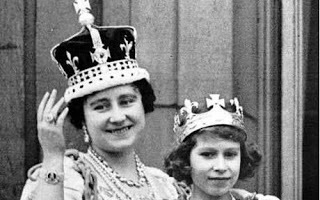 The last person to wear the diamond was the Queen Mother, mother of Elizabeth II. The current queen has never worn it, perhaps because of an ongoing controversy with India over which country should possess the gem. The Hope has, perhaps, the most colorful history of all. It actually started out as the Tavernier Blue, owned by a French diamond merchant who obtained the deep-blue diamond from the Mogul Emperor, Shah Jahan. When the merchant presented the stone to Louis XIV, the French King had to have it. In 1673, it was recut into a heart, and was thereafter called the French Blue. Louis XIV wore it in a cravat pin. It was held by French royalty until the French Revolution, when the Crown Jewels, including the French Blue were put on display to the public in the National Treasury located in Paris. In 1792, looters stole the Crown Jewels and the French Blue disappeared. In 1839, a beautiful deep-blue diamond surfaced, owned by Henry Philip Hope, a prominent London banker. The stone wasn’t the same heart shape, but it was suspected to be the French Blue in still another re-cut form. (It was not until 2005, when a computer model study was conducted on the stone, that this suspicion became certainty.) The Hopes owned the stone until 1901, when it began an 11 year nomadic life, eventually ending up in the hands of American socialite, Evalyn Walsh McLean. When she died in 1947, Harry Winston bought her entire jewelry collection and, in 1958, he gifted the Hope Diamond to the Smithsonian. This diamond is one of the most visited exhibits at the museum. It is thought that the Orlov Diamond was once part of a much larger stone, again unearthed during the reign of Shah Jahan. But, by the mid-1700s, the diamond was possessed by an Armenian diamond dealer called Safras. Catherine II, Empress of Russia, invited Safras to St. Petersburg, with the intention of buying the diamond. But the deal was never finalized, and Catherine didn’t get her diamond until her lover, Russian nobleman Grigory Orlov, negotiated a deal with Safras. Orlov’s name became forever tied to the gem, even though the gem didn’t permanently tie Orlov to Catherine. Ultimately, the diamond was set into Catherine II’s Scepter, where it remains to this day as part of the permanent display at the Kremlin in Moscow. For those of you who like numbers, the Koh-i-Noor is 105.6 carats. 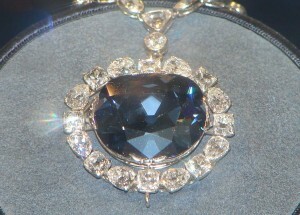 The Hope Diamond is 45.52 carats and the Orlov is the largest, at 189.62 carats. Just to give you an idea of size, the Hope Diamond is about the size of an unshelled walnut and the Orlov is shaped like one half of a hen’s egg. Much of my information came from a wonderful exhibit called “Diamonds are Forever: The Incredible Journeys of World-Famous Diamonds and the People Who Owned Them”, showing through April 19th at the Mini Time Machine Museum of Miniatures in Tucson, Arizona. But there are also many websites and books devoted to these famous diamonds.